This is a nice short family hike with little elevation change. 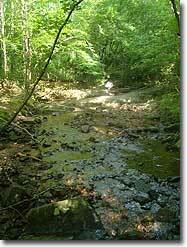 Ivy Creek Natural Area, in Charlottesville VA, is the sister hike to Ragged Mountain. There are multiple trails at Ivy Creek and we put together an outward loop incorporating parts of many of them. We saw lots of wildlife, deer, one huge buck, squirrels, tons of birds, etc. Their website has great information about the flora and fauna. We crossed many creeks during the hike with small bridges at all of the crossings. 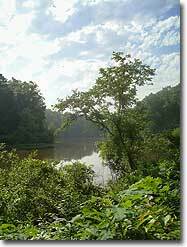 Some of the hike also parallel Ivy Creek eventually emptying into the Rivanna River Reservoir. About every .25 to .50 miles there is a bench to rest on. Be sure to do the Peninsula Loop as that is where there are some great views of the creek and reservoir. 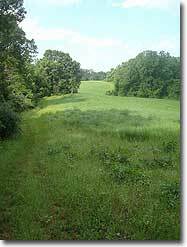 We hiked Ivy Creek Natural Area as a clockwise outer-loop. The hike begins at the main parking area, we headed south to the Red Trail that goes through a Native Grass Restoration field, in 0.1 miles turn left onto the Yellow Trail. The trail is well shaded from here until near the end of the hike. In 0.5 miles turn left onto the Red Trail and in 0.1 miles turn left onto the Green Trail. Over the next mile or so are multiple creek crossings. In 0.7 miles pass under a telephone line and in 0.1 miles turn once again onto the Red Trail. In 0.1 miles turn onto the Orange Trail and very quickly turn onto the left branch of the Orange Trail. In 0.1 miles the Orange Trail will once again bear to the left, keeping you on the outer-loop of the trail system. The next 0.8 miles until the Peninsula Trail has a couple of views through the trees of Ivy Creek. 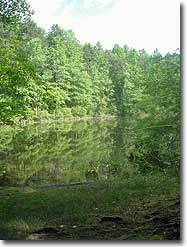 Turn left onto the purple Peninsula Loop Trail which will have some great views of Ivy Creek and the Rivanna Reservoir, the loop is about 0.8 miles long. It was a little over-grown when we hiked it. After completing the loop, take a left onto the Orange Trail, go 0.2 miles and take a left onto the Red Trail. Stay on the Red Trail for 0.5 miles, many intersections in this section, when in doubt continue to bear left until the Blue Trail with some more good views of the reservoir. Bear left on the Blue Trail for 0.3 miles and bear left onto the Purple Trail reaching the Hydraulic Overlook spur trail on your left very quickly. In the fall without leaves on the trees their may be a better view of the reservoir. Return from the spur trail and bear left back onto the Purple Trail. The next section goes through another native grass restoration area. In 0.2 miles reach the Paved Trail, continue past the education Bldg and information kiosk and reach the parking lot in 0.1 miles. Nice hike with significant-enough elevation change for me to call it a hike. On my GPS device I measured 4.1 miles rather than the 4.8 miles given in the description. The description refers to a "green Penninsula Loop Trail" -- in fact, it's purple as indicated on the map. There are two different links for the map on the hike page -- one at the top works, one below does not at the moment. Also, the link to the Ivy Creek Foundation does not work. If you are having trouble finding a map, search "Ivy Creek Foundation" and you can download a map there. I relied mostly on my GPS device and the provided GPS track. There are laminated maps in boxes throughout the hike that I guess you can borrow and take with you. I was scared to find about 40 cars in the parking lot when I arrived early in the morning but they were there for some event or class. Only a couple of other people on the trails. From Hiking: Thanks. The directions and links have been corrected. This is more of a park in a suburban area than a hike. My friend and I searched for hikes near Carter Mountain because we were going apple picking in the afternoon. This was a lovely morning outside, but more of a walk in a wooded park than a hike. Good if you're in the area and want to get outside for a bit. It's Martin Luther King, Jr. weekend and finally acting like winter. We wanted a walk in the woods and we go it. We imagined it during the summer with tons of shade, It's an easy walk for the family, but still feels like you got a work out. I wouldn't drive out of my way for it again, but it was very nice on a snowy day. I've been looking for a nice hike for my 10-year-old daughter, but most of the trails we've tried have been off the Blue Ridge Parkway. The elevation changes were a little much for her. I hiked Ivy Creek by myself and found that it will likely be a good place for her to explore without completely running out of steam. Can't wait for a return trip to introduce her to the trails. A nice, easy trail if you're in/around Charlottesville and don't want to go too far for a nice walk in the woods. The trails clearly marked and well maintained. We imagine that there's a lot of cover when there are actually leaves on the trees. For being close to Charlottesville and some busy roads, the trail was still pretty quiet. 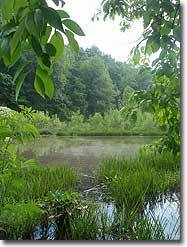 A good variance in landscape- woods, grasslands, and marshy areas near the water. We went at a pretty decent pace, took a few breaks for water/snacks, still did 5 miles in about 2 hours. So many trails let you customize your hike as you want and it gives great options for people of all ages. Plus, the kiosk near the parking lot is really informative.